An organization considers itself lucky when it has reliable, go-to volunteers who can fill any need when asked. One such volunteer for Cornerstones is Gail Greenberg. Gail happens to represent her synagogue on the Cornerstones’ Board of Directors, but on any given day you can find Gail leading games at Cornerstones’ Embry Rucker Community Shelter, sorting food donations at the Cornerstones’ Food Pantry, working with clients in the community who have been identified as at risk for hoarding, or serving as an ambassador speaking on behalf of Cornerstones’ at community events. Gail also plays a significant role as a volunteer in the organization of the annual Cornerstones’ Back-to-School Drive which provides over 3,000 back packs to children in the community, and the Thanksgiving and Gifts-for-Kids Drives, which provide gifts for nearly 900 families. “When there is a volunteer need, Gail is often the first and only call we need to make. If she is not available to volunteer she will quickly recruit other capable volunteers to fill the need.” Susan Alger, Volunteer Manager, Embry Rucker Community Shelter. A skilled fundraiser, Gail is adept at everything from educating local businesses about why they should support Cornerstones to selling raffle tickets during Cornerstones’ fundraising events. In 2014, when Fannie Mae announced it would no longer be sponsoring the annual Help the Homeless Walks, non-profits faced the challenge of having to support these walks themselves. Many non-profits were simply not able to host their own events, resulting in the loss of critical funding. Gail, however, quickly stepped up to the challenge of co-chairing the event for Cornerstones. In her role as co-chair, Gail ran planning meetings, secured a walk route, recruited over 30 volunteers, obtained donations from business and local congregations, and coordinated participation of other community groups. 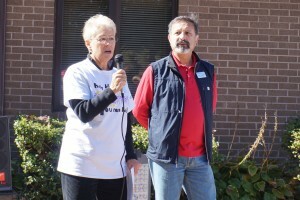 The event attracted a record-breaking 350 walkers and raised over $12,000. Without Gail’s leadership, Cornerstones’ 2014 Help the Homeless Community Walk very likely would not have taken place.